Since then, I’ve made these cookies for parties, potlucks and just because. I set them out and wait. I love seeing the look on people’s faces when they try the first bite. Inevitably, their face contorts into a, “this is amazing!” sort of way and can’t help but verbally announce how divine the cookies are. Then they look around and start asking everyone who made them. The minute I speak up, people literally hound me for the recipe and follow up with emails begging for it. They crave these things and I understand, because I’m right there too. As far as recipes go, this one is ridiculously easy and really fun to make with all-aged children. The bonus? There is no refined sugar (with the exception of what’s found in chocolate chips), they are gluten-free, and full of fiber. Bars – Press the mixture into a baking dish. 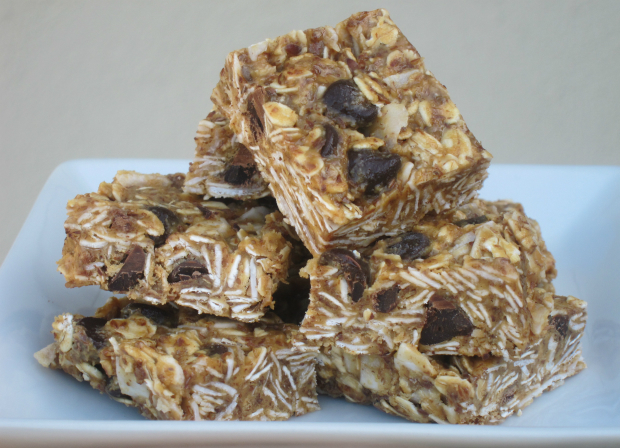 If it’s a large dish, your bars will be thinner. If you use a smaller one, your bars will be thicker (you can cut them into cubes instead of rectangular balls). Let the dish chill in the freezer for 30 minutes. Once chilled, cut them into bars with a heavy knife and serve immediately. Balls – Leave the mixture in the bowl and stick the whole bowl into the freezer for 30 minutes. Once chilled, remove mixture and roll into small balls. Serve immediately. The Other Method – Stick the bowl into the freezer for 10 minutes or as long as you can handle it. Once slightly chilled, grab a spoon and dig in. If you bring them to a party, it’s best to store them in the fridge or freezer until it’s time to eat them. You can keep these cookies in a closed container in refrigerator or freezer for a week, but I can pretty much guarantee they’ll be eaten WAY sooner than this. I tried shredded coconut, but I personally like the large hunks of coconut flakes way better. Just be sure to get the unsweetened variety. Use fair trade chocolate whenever possible as it is your best chance at avoiding child labor. If you prefer, you can also use a bar of 72% fair trade dark chocolate (Trader Joes has a great one). Just break it into small pieces and use in place of the chocolate chips. I use a plunger-style measuring cup for this recipe. It is so awesome for messy and wet ingredients like honey, peanut butter, molasses and mayonnaise. I highly recommend adding one to your kitchen. Make sure you are buying raw honey. Local is best, so check out your local farmers market for resources. Unless you go through your flaxseed quickly, store it in a glass container in the fridge to avoid rancidity. 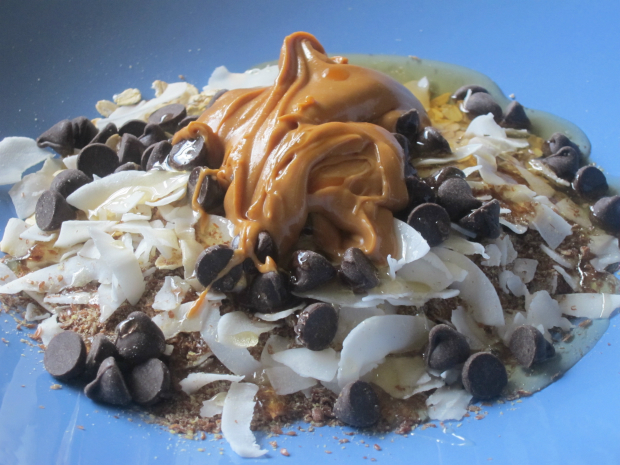 I’ve used both chunky peanut butter and smooth…they are both incredible. I tend to have most of these ingredients on hand, with the exception of chocolate chips (hmm…wonder why that is). If you are in a pinch, use 1-2 tablespoons of cocoa powder in place of the chocolate chips. You’ll still get the chocolately flavor, but without the crunch.